You'll be £16.99 closer to your next £10.00 credit when you purchase Walking the Western Front 1914 - The BEF and the Retreat. What's this? Following on from the success of the two films on Ypres (Slaughter of the Innocents and The Immortal Salient) and three films on the Somme, The Walking the Western Front series turns its attention to the outbreak of the First World War and the key battles that were fought during the opening phases from August 1914 into 1915. Spread across four seventy-minute DVDs, acclaimed film-maker Ed Skelding and eminent military historian Nigel Cave take us on a tour of the battlefields and cemeteries of Mons, Le Cateau, the Aisne, Ypres and many more as they exist today and explain the opening battles of WWI in their entirety. Nigel relies on his encyclopedic knowledge of the area to explain these harrowing and heroic battles in detail, giving the viewer an armchair tour of the key sites and memorials in France and Belgium. Accompanied by a selection of original photographs from the period and exclusive money off vouchers for related books from the Pen and Sword catalogue, these DVDs are the perfect companion for fans of the Battleground series and students of the Great War alike. 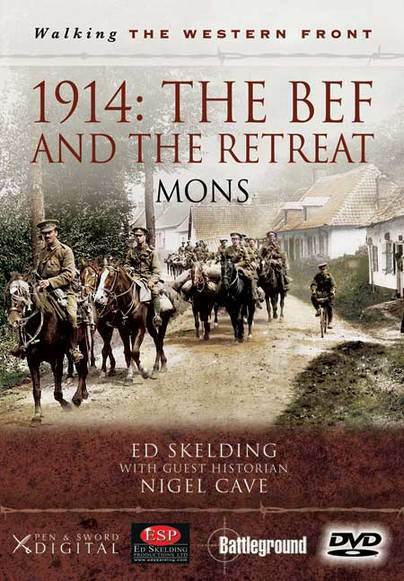 A companion book on the Somme and Ypres will be released by Ed Skelding in November 2014 and mid-2015 respectively, showing the battle through the eyes of a film-maker and will present original black and white photographs of the battlefield and present day pictures to show how the battlefields have changed over the years. Pen and Sword Digital has teamed up with Ed Skelding Productions to create a small selection of high quality films on the First World War. Presented by well-known historian and acclaimed filmmaker Ed Skelding and with key guests such as Nigel Cave, an experienced historian and series editor for the hugely popular Battleground series of books, these highly knowledgeable films put the viewers in the key locations of battles and make you feel part of the tragic events. Starting with two films on the history of Ypres, three further films will be released in 2012 and 2013 describing the main battles on the Somme.